Olympus OM-D E-M5 with 9-18mm 4.0-5.6 lens @ 9mm. Processed with Lightroom and Perfect Effects 4 and Perfect B&W. 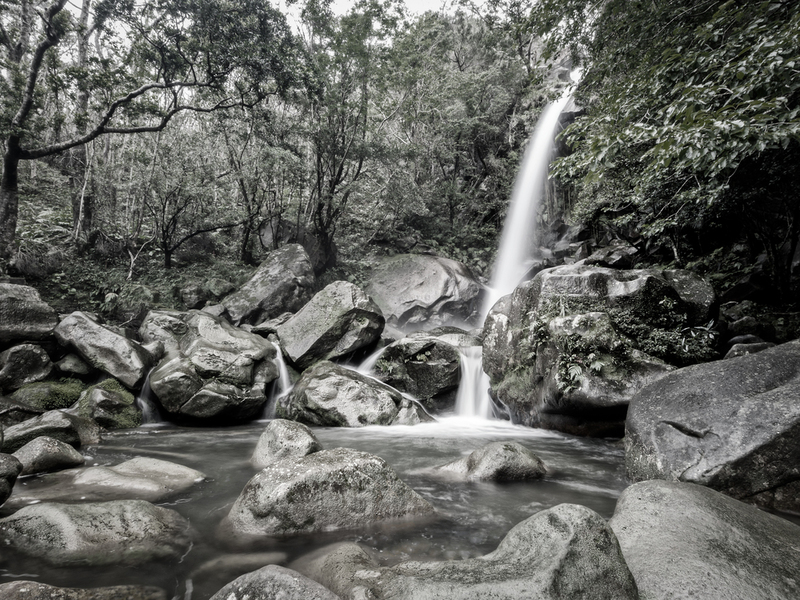 Two days ago I posted a long article and photo from a trip my wife and I made to Todoroki Falls here in Okinawa. The photo was targeted and focused on how this fern existed in relation to this incredible waterfall. I crafted the photo to tell the story I wanted by darkening the scene (despite the fact it was 10am in the morning) and adding a touch of light to highlight the plant. Today's photo is basically the opposite technique, where with a wide angle lens, I'm capturing the whole scene. It's still a long exposure to get the silky effect on the water but here you can see much more of what's going on. You may ask, which one do I prefer; well it's the targeted one. Most of the time, I prefer that style but it doesn't mean you can't venture into other perspectives as well. I went ahead and converted to black and white, but look real close with my telltale dash of color left behind. Enjoy.